9. Salzburg Art Project | Jaume Plensa | Stiftung für Kunst und Kultur e.V. 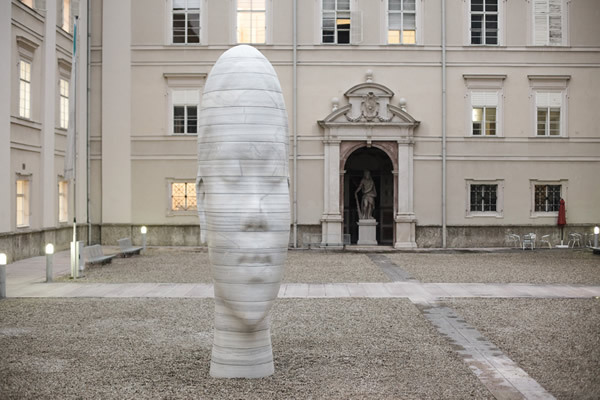 For the Ninth Salzburg Art Project, the Catalan artist Jaume Plensa has created a sculpture for the “Dietrichsruh” in the University of Salzburg: Bearing the title “Awilda”, it is a monumental 5-metre-high bust of a young girl with Caribbean facial features, fashioned from white Spanish marble. Seemingly springing up out of the ground, the figure suggests distance and proximity simultaneously. It exudes a preternatural tranquillity and an enigmatic aura. Although we see clearly the head of a girl, “Awilda” immediately begins to withdraw from the unambiguity of that initial moment of recognition. The artist succeeds in unravelling our perception by having sculpted his work not from a block, but from 20 slabs of the same height, each of a different circumference, which, stacked on top of each other, are mounted on a steel pole anchored to the ground. Consequently, the head seems to oscillate, spiral upwards into the sky, and generate a rippling wave rising and falling over its surface. As we circumambulate the figure, its silhouette seems to change permanently.